Off to Mexico we go! Today my family and I are traveling to Cozumel, Mexico and I am so excited! I couldn't think of a better way to kick off the summer. After an exhausting week of finals, I am looking forward to laying on the beach for a week straight. But before we get to the beach, we have a long day of travel. We are flying from Sacramento ---> Houston ---> Cancun, then taking a ferry to Cozumel. A lot of people get stressed out by travel days, but I actually love them! Last year was a huge travel year for me. India, France, England, and smaller trips throughout the year meant so much joy, staying more organized, and packing as smart as possible. Whether you're preparing for a quick weekend road trip or a huge trip to another country, these travel essentials have proven to be so useful. 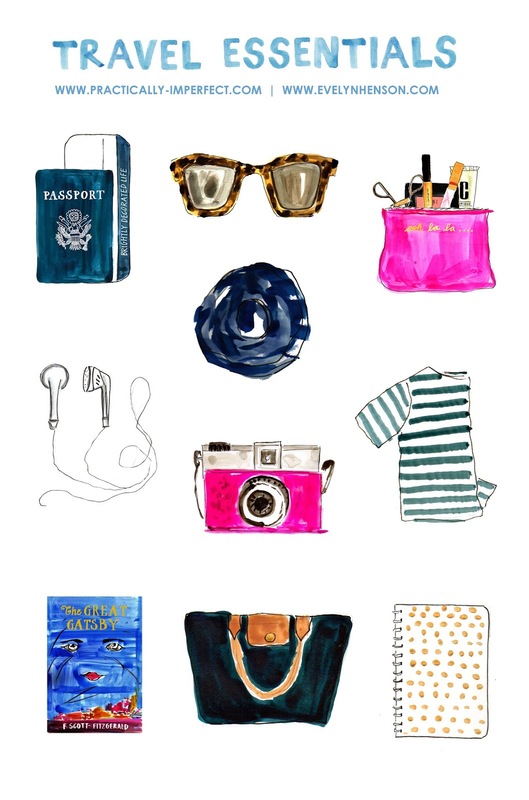 I teamed up with the incredible artist Evelyn Hensen to share my travel must-haves! One of my favorite ways to capture the memories from a trip is to journal them out. I love looking back on all of the memories and experiences. Take the time each day to journal where you went, what you did, who you met, and what you discovered. After a big trip, one of my favorite things to do is reread my travel jounrals. They always take me right back to the moments of my trip. I try to only pack my must-haves and fit them into a carryon sized makeup bag. A great way is to bring sample sized products like mini mascaras and moisturizers. After a long plane ride, there is nothing better than freshening up and taking on the city! When I'm looking back on photos, I'm always thankful that I took a few extra moments to look my best. On a long flight or car ride there is nothing better than staying cozy with a blanket scarf. I'm usually freezing when I'm traveling, so this is the best way to stay warm and stylish (and hide from the world when I want to take a nap). This one's a no brainer! Headphones are necessary for all of those travel playlists! These Spotify playlists from EF College Break are my favorite! Plus, headphones help tune out that awful airplane noise. I've yet to meet someone who wishes they took less photos while traveling. Taking the time to capture memories is always worth it. Months and years after your trip, you will be so thankful that you brought along a nice camera instead of just depending on your camera app. You really can't go wrong with a classic striped shirt. On my last long trip, I packed lots of fancier pieces that took up a ton of space in my luggage and then ended up wearing the same striped tee over and over! I think its better to pack simple pieces and then dress them up or down with the right accessories. Packing simpler, classic pieces that save space and effort is the way to go! Sunglasses are necessary for exploring a new city. Sunglasses like these that just happen to be really cute are even better! One book (yes, just one) is perfect for filling in the moments in between adventures! I always want to bring more books, but the only time I end up reading is on the airplane ride, a few minutes before falling asleep, or lounging in the sun. Throw it all together in the perfect tote! Time and time again, my favorite travel bag has been this Longchamp bag. It's water resistant, big enough to fit my laptop, and completely worth the investment! What are some carry ons that you can't live without? I'd love to read in the comments below! Shop my travel essentials using the links above and then head over to Evelyn's blog for more fun! I'm so excited she and I could team up to create this post! I love Evelyn's designs, so fun that you got to work together! Yes, it was so fun!! I'm so glad we could too! Thanks for reading! Aw! This is so cute! A good book and headphones are defiantly necessities for me! Thank you so much! And yes, I think headphones are key to happy travels!